By installing TENMAT components, leading OEMs and rail operators are able to constantly increase capacity of modern networks. These reliable products offer better protection to keep rolling stock operating at high levels. 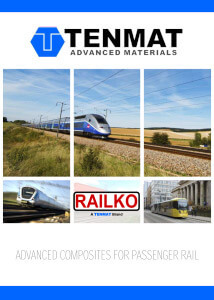 In intercity commuter trains, TENMAT’s Feroform and Railko materials are used as Scharfenberg coupler bushes, window wiper bushes, corridor end face plates, gangway tread plates, door opening system bushes, and air spring system plates. Major rail systems benefit from our products, including Bombardier Aventra trains for UK Cross Rail, Bombardier AGC trains for SNCF, and Bombardier REGIO 2N double decker trains used by SNCF.